Here's a simple bar trick that you can pull off at your next alcohol-fueled gathering. 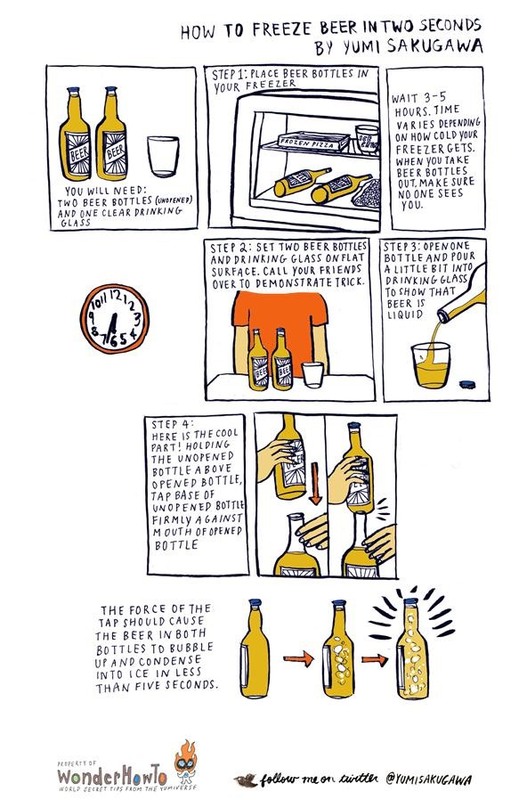 Tap one beer bottle against another to freeze both beer bottles into solid ice in 2 to 3 seconds. All you need to do beforehand is place both beer bottles in the freezer for 3 to 5 hours. When you leave a bottled beverage in an environment that is as cold or colder than zero-degrees centigrade, the liquid molecules become suspended in a state of temperature that is less than zero-degrees centigrade. When you take the bottled beverage out of freezing temperature and tap it against a countertop or other hard surface, this disturbs the molecules and causes a chain reaction which results in the near-instantaneous formation of an ice crystal. News: Make your beer can stand sideways. This is the very worse project i have ever seen on "wonderhowto". Putting a beer in the freezer for 3-5 hours isnt exactly freezing a beer in 2 seconds. fyi, i forgot to mention, the bottom bottle should be full for best effect, and, i learned this trick in the UK where they drink room-temp beer in thicker bottles best eruption, US bottles are thinner and will shatter if you tap too hard, but it works, just not as awe-inspiring.